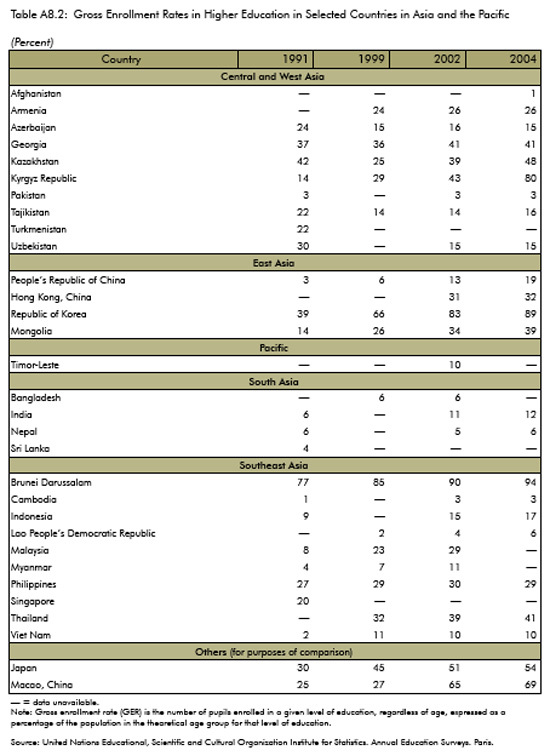 Source: Asian Development Bank (2008) Education and Skills: Strategies for Accelerated Development in Asia and the Pacific, Manila: Asian Development Bank. 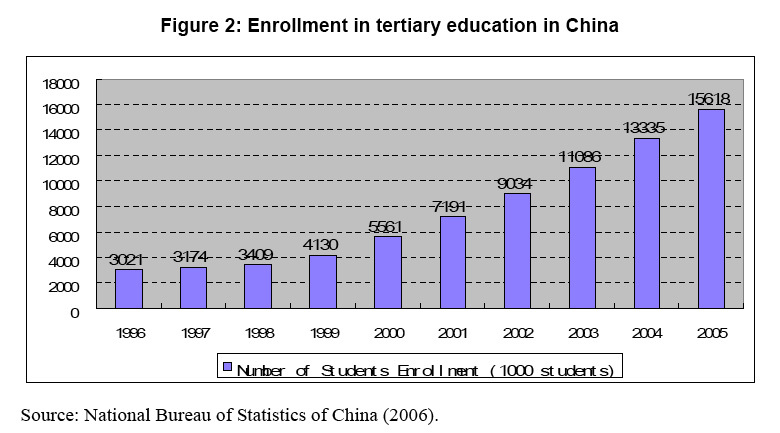 ‘Documenting China’s higher ed explosion‘, Inside Higher Ed, 1 April 2008. Li, Y., Whalley, J., Zhang, S., and Zhao, X. (2008) ‘The higher educational transformation of China and its global implications’, National Bureau Of Economic Research Working Paper 13849. It is thus noteworthy that the “Scientific business of Thomson Reuters” (as they are now known) has been seeking to position itself as a key analyst of the changing contribution of China-based scholars to the global research landscape. As anyone who has worked in Asia knows, the power of bibliometrics is immense, and quickly becoming more so, within the relevant governance systems that operate across the region. The strategists at Scientific clearly have their eye on the horizon, and are laying the foundations for a key presence in future of deliberations about the production of knowledge in and on China (and the Asia-Pacific more generally). One of the mechanisms to establish a presence and effect is the production of knowledge about knowledge (in this case patents and ISI Web of Science citable articles), as well as gifts. On the gift economy front, yesterday marked the establishment of the first ‘Thomson Reuters Research Fronts Award 2008’, which was jointly sponsored Thomson Reuters and the Chinese Academy of Sciences (CAS) “Research Front Analysis Center”, National Science Library. The awards ceremony was held in the sumptuous setting of the Hotel Nikko New Century Beijing. This accolade is awarded to prominent scientific papers and their corresponding authors in recognition of their outstanding pioneering research and influential contribution to international research and development (R&D). The event was attended by over 150 of the winners’ industry peers from leading research institutions, universities and libraries. All journals added to the Web of Science go through a rigorous selection process. To meet stringent criteria for selection, regional journals must be published on time, have English-language bibliographic information (title, abstract, keywords), and cited references must be in the Roman alphabet. In a general sense, this is a positive development; one that many regionally-focused scholars have been crying out for for years. There are inevitably some issues being grappled with about just which ‘regional’ journals are included, the implications for authors and publishers to include English-language bibliographic information (not cheap on a mass basis), and whether it really matters in the end to a globalizing higher education system that seems to be fixated on international refereed (IR) journal outlets. Still, this is progress of a notable type. The horizon scanning Thomson Reuters is engaged in generates relevant information for many audiences. 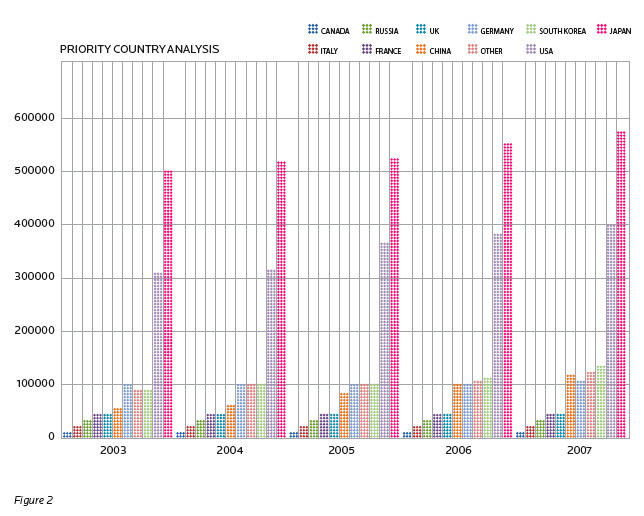 For example, see the two graphics below, which track 2003-2007 patent production rates and levels within select “priority countries”. The graphics are available in World IP Today by Thomson Reuters (2008). Click on them for a sensible (for the eye) size. Thus we see China as a rapidly increasing producer of IP (in the form of patents), though in a system that is relatively more dependent upon its universities to act as a base for the production process. 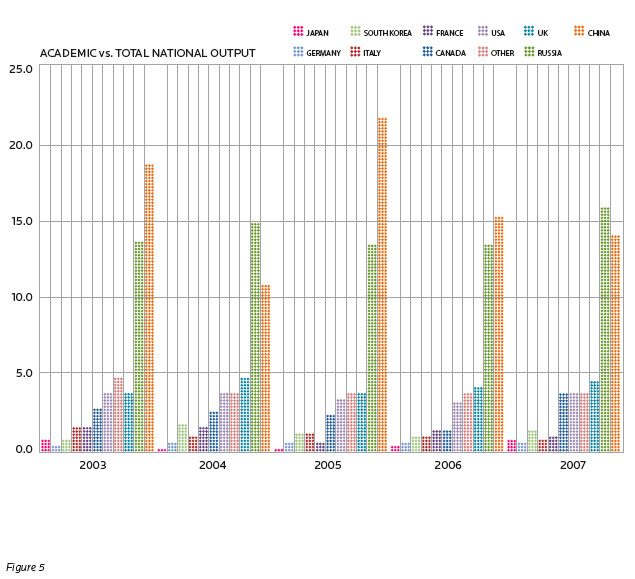 To be sure private and state-owned enterprises will become more significant over time in China (and Russia), but the relative importance of universities (versus firms or research-only agencies) in the knowledge production landscape is to be noted. Through the production of such knowledge, technologies, and events, the Scientific business of Thomson Reuters seeks to function as the key global broker of knowledge about knowledge. Yet the role of this institution in providing and reshaping the architecture that shapes ever more scholars’ careers, and ever more higher education systems, is remarkably under-examined. 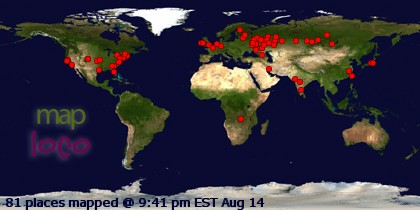 ps: alas GlobalHigherEd is still being censored out in China as we use a WordPress.com blogging platform and the Chinese government is blanket censoring all WordPress.com blogs. So much for knowledge sharing! National Public Radio (NPR) in the United States played three shows on the 11 May Sunday Weekend Edition about global higher ed issues. All three are available below. Weekend Edition Sunday, May 11, 2008 – In the past few years there has been an increase in applications to American graduate schools but the rate of growth is slowing. Beth McMurtrie, international editor of the Chronicle of Higher Education talks with Liane Hansen about why there has been a decline in the number of foreign students attending U.S. universities. Weekend Edition Sunday, May 11, 2008 – China is in the midst of a building boom of colleges and universities. The country is attempting to improve the quality of these institutions and its world ranking. Thanks to Noel Radomski of WISCAPE for the tip. Source: Li, Y., Whalley, J., Zhang, S., and Zhao, X. (2008) ‘The higher educational transformation of China and its global implications’, National Bureau Of Economic Research Working Paper 13849. 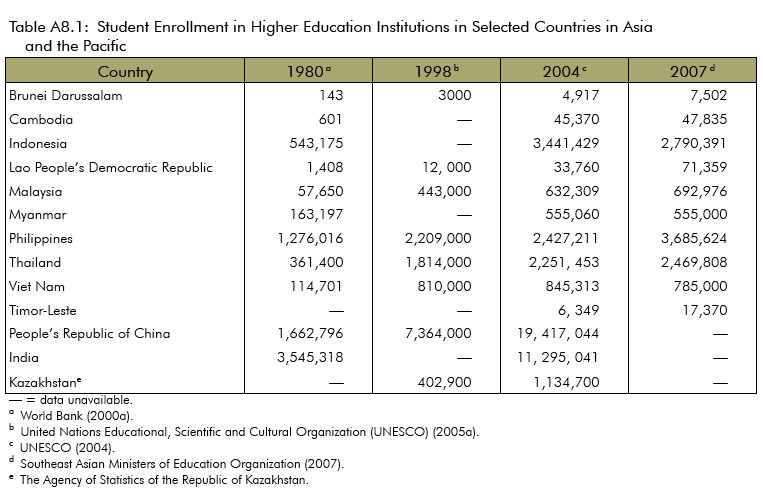 Also see: ‘Documenting China’s higher ed explosion‘, Inside Higher Ed, 1 April 2008. Editor’s note: this guest entry has been kindly prepared by Daniel A. Bell, Professor of Philosophy, Tsinghua University, Beijing, PRC. Daniel (pictured to the left) is the author or editor of numerous books including Communitarianism and Its Critics (Oxford: Oxford University Press, 1993), East Meets West (Princeton: Princeton University Press, 2000), Beyond Liberal Democracy: Political Thinking for an East Asian Context (Princeton: Princeton University Press, 2006), Confucian Political Ethics (Princeton: Princeton University Press, 2006) and Ethics in Action (New York: Cambridge University Press; United Nations University Press, 2006). He has worked in the PRC, Hong Kong SAR, Singapore, and the USA. Perhaps the most dramatic change in the Chinese higher education system has been the huge increase of students, without a comparable increase in government funding. 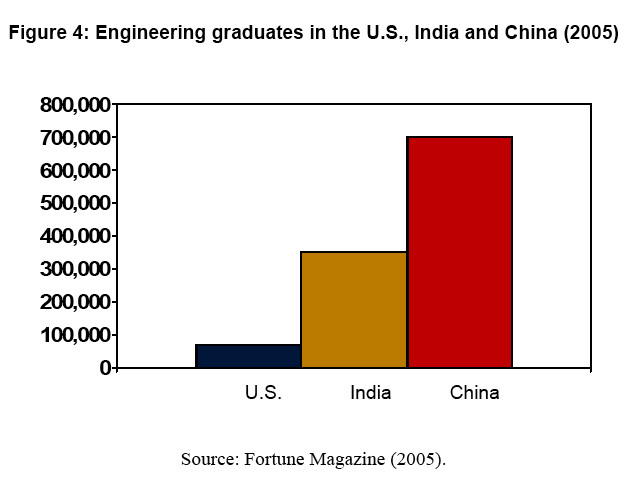 Hence, many universities now find themselves in the red. And students often find it harder to get good jobs after they graduate, even those from top universities like Beijing University. If this trend continues, at some point it will become less “rational” (from an economic point of view) to get a university degree. I’ve already heard anecdotal evidence of secondary school students being encouraged (by parents and friends) to find jobs rather than sit through the grueling national examinations for university spots. But I’ve been asked to talk about changes related to “the global” so let me focus on the issue of linkages with Western universities. What I say stems more from my experience teaching at Tsinghua University (I’m hired on local terms to teach political philosophy) rather than from systematic research on the topic. One clear trend is the effort by Western universities to forge linkages, formal and otherwise, with Chinese universities, especially prestigious universities in Beijing and Shanghai. An administrator friend at Tsinghua tells me he is flooded with such requests and can accommodate only a small percentage of them. The situation at Beijing University is similar and I’ve heard that requests from not-so-famous Western universities are arrogantly rebuffed. Western universities that have yet to enter the market should therefore consider linkages with Chinese universities outside the main cities. The differences in academic quality may not be all that great and there may be higher levels of enthusiasm and cooperation among such universities. I’ve also heard one important complaint from the Chinese side. 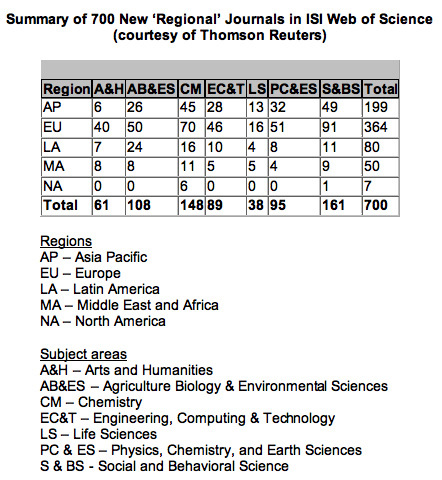 When universities such as Stanford and Harvard seek to implement “learning in China” programs, they often insist on bringing in their own professors in the name of “quality control”. One wonders if it’s really worth the effort (and expense) to bring students over to China so that they will be taught by the same professors they’d have at home. And sometimes, what goes in the “quality control” may in fact stem from different understandings of “responsible teaching”. In a Western university, the teacher is supposed to prepare a detailed syllabus, with the topics and readings for each lecture decided at the beginning of term. Few Chinese professors prepare such syllabi and thus they would fail the test of Western-style “quality control”. But the main reason for “vague” Chinese syllabi is that lectures – especially at the graduate level — tend to be more informal, with the ebb and flow of discussion influencing the following week’s topics. Rather than insist on conformity to Western-style norms, it seems to me that Western universities should encourage their students to be exposed to different learning experiences. Let me say something about academic freedom in Chinese universities, which has been source of worry for Western universities that seek linkages in the humanities and the social sciences. In my experience – and I teach in a sensitive area — classroom discussion has been unexpectedly free and uninhibited. I’ve rarely experienced the fear that seems to grip students in Singapore when the discussion veers towards critical evaluation of the government leaders and policies (I taught in Singapore in the early 1990s and things may have improved since then). Of course, there are some constraints in China – it would not be wise to engage in prolonged and emotional discussion of the events of June 4th, 1989 – but even these constraints tend to disappear during the course of the term, as trust develops between teacher and students. I do not mean to imply that academic freedom should be limited to the classroom – those of us working in China often experience the severe and seemingly arbitrary constraints on publication of our research. But Western universities that seek alternative learning experiences for their students need not worry too much about such constraints. Note: WEI = World Education Indicators (WEI) Programme, a UNESCO initiative that analyses the progress made by 19 middle-income and developing countries. 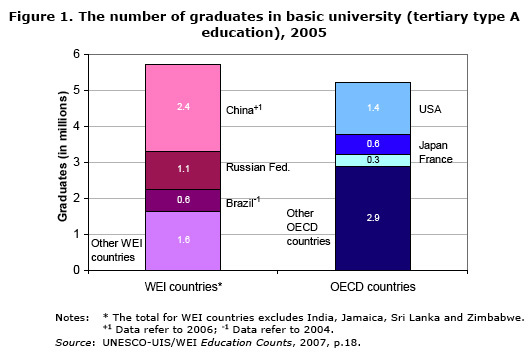 Source: UNESCO (2007) ‘Highlights from the UIS report: Education Counts Benchmarking Progress in 19 WEI Countries’, September.